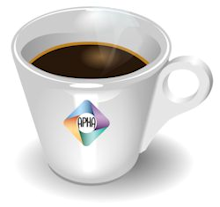 Getting too much email from APHA Members Connect? Or maybe you'd like to receive more frequent notifications of new topics or replies? 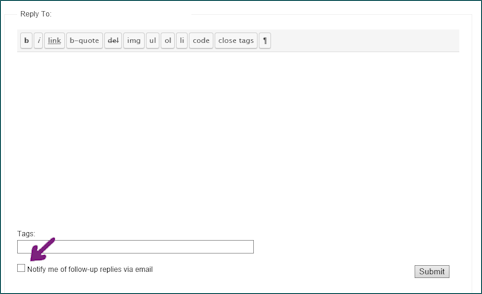 You can increase or decrease the frequency of email notifications you will receive from the Discussion Forum. A Daily Digest: receive one notice per day with links to all topics and replies that have taken place in the preceding 24 hours. A Weekly Digest: This is the default. Receive one notice per week with links to all topics and replies that have taken place in the preceding week. A Monthly Digest: receive one notice per month with links to all topics and replies that have taken place in the preceding month. On a per conversation basis - you choose which conversations you'd like to be notified about. These notifications take place as they are updated, slow down as the conversation dwindles, and stop when the conversation subsides. Find the instructions for making changes below. Return to Getting Started with APHA Members Connect! New members are set up for Daily Digests as their memberships are approved. Any member may change the frequency of APHA Members Connect! notifications at any time. Link to APHA Connect! - and find your photo on the right among "Who's Online?" Click on your photo. If you have trouble finding yours (because yes, there are lots of generic gray icons) - there is a way to figure out which one is yours. Find instructions here. Clicking on your photo or icon will take you to your Profile page. Click on the word Profile, then on the word Edit - as seen at right. You'll see "Editing 'Base' Profile Group and directly below your name, you'll see your frequency options. 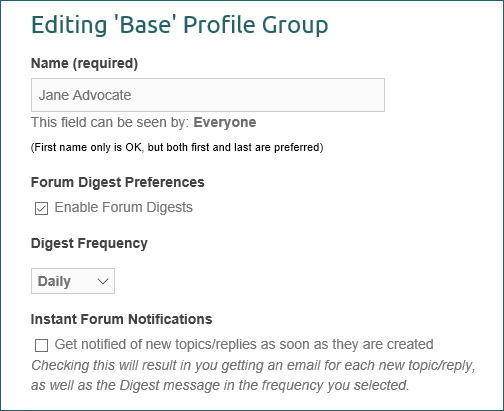 Tick the box for Enabling Forum Digest Preferences, then choose your frequency from the drop down. You can also choose to get notices every time a new topic is begun or reply is posted. 4. Important! Be sure to Save Changes at the bottom of the page. There are two ways you can be notified per update. You can subscribe to a Forum (main categories on the Connect! Homepage) or an individual Topic - by clicking on the word Subscribe in the upper right corner. It will then change to the word "Unsubscribe", so If you decide later that you don't want these notices anymore, click on the word Unsubscribe. 2. You can be notified anytime someone adds to a conversation you are interested in by ticking the box at the end of a post you've just added, so you'll be notified when someone responds to your post.